Dietland, adapted from Sarai Walker’s novel of the same name, does seem to have a rather predictable plot. But Joy Nash wins your empathy with her performance. “That’s me, Alicia Kettle, but everyone calls me Plum because I’m succulent and round.” That’s how the protagonist of Dietland introduces herself, as she meets your gaze with her grey, forlorn eyes. She then goes on to call herself “fat”, and adds, “I’m allowed to say it”. The air of nonchalance in her admission, which is rather refreshing at first, turns out to be misleading. Plum is about to get bariatric surgery. Much like everybody else, Alicia not only calls herself Plum but just like everyone else, says the word critically. The 10-episode series chronicles Plum’s relentless journey towards preparing herself for the surgery, surviving on a militant and minimal diet, being bullied and stalked by strangers, falling in love, losing her job and so on and so forth. Dietland, adapted from Sarai Walker’s novel of the same name, does seem to have a rather predictable plot. Several voices and faces have told and re-told the story of an overweight protagonist, portrayed brilliantly by Joy Nash, struggling to accept herself and her final triumph in doing so. Nash plays Plum, a ghostwriter for the editor of one of New York’s hottest fashion magazines — a stick-thin, perfectly groomed, permanently on-edge editor played by Juliana Margulies. The Amy Schumer-starring film, I Feel Pretty has a similar storyline hinged on a woman who judges her worth by her girth. But Dietland subverts this familiar narrative by punctuating it with rage. In the post #MeToo world, women might still not be safe but they no longer need to hide their anger. The sub-plot of an undercover feminist terrorist organisation, Jennifer further darkens the narrative. Known by an unanimous name, the organisation will not stop short of killing men who have wronged women. The paths of Plum and the various Jennifer(s) cross and this is where the first season ends. 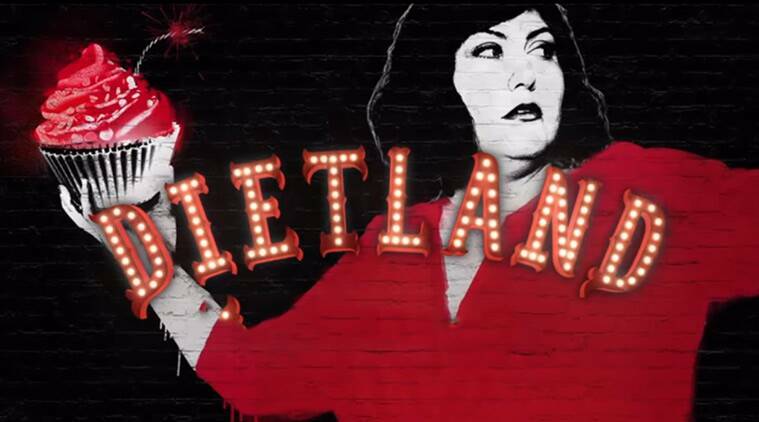 Dietland can be described in several ways — a dark comedy, a raging feminist commentary and even a reimagining of a post-apocalyptic world where ideas and isms have taken over our sensibilities. Much to the credit of the stellar cast, Season One does work in most parts. Plum Kettle, walking with a pronounced frown on her face, is an extremely relatable character. She knows the vicious cycle of patriarchy too well, but still wants to be the “heroine to the hero” and not the “hero” of her story. She is aware that she is smarter than her boss but she would still like to have the latter’s rail-thin arms and petite frame. Nash wins your compassion with her performance. Margulies is brilliant as Kitty Montgomery, the fashion magazine editor who knows more than her male counterparts and would rather pat them than be patted (by them). Leeta played by Erin Drake leaves quite an impression as the girl who burns her hands while playing with fire. Tramell Tillman is great as Plum’s gay black friend, who discourages her from going for the surgery but also raises concerns regarding her health when she finally “accepts herself” and her weight. It’s because the characters aren’t always politically correct, that you end up relating to how real and fragile they are. But Dietland bites off more than it can chew. It chooses not to be as simplistic and unidirectional as I Feel Pretty, in doling out its message, but the plot meanders too much till it completely loses steam. The activities of Jennifer might seem intriguing at the beginning. but soon they are all over the place and by the fifth episode it is difficult to remain invested in them anymore. However, one cannot and should not dismiss Dietland. The series raises some important questions and does not claim to have answers for all. It also unveils the faces of some very angry women and shows how the same problems gnaw away at them even though they are from different social stratas. This alone should suffice as a reason to give this series a chance. To make you realise that from the prettiest to the thinnest to the fattest woman you know, each one is fighting their own personal battles.